Nurse, this is deﬁnitely a case where a transplant results in a series of foot tapping. hip shaking, head bobbing side effects known throughout the world as the Kenney Poison syndrome. Prognosis: A highly infectious good time ONLY if you attend Kermey PoIson‘s “Paradise” compact release party Sept. 25 at the Merced Multicultural Arts Center, prescribed by the Merced County Arts Council and KJAZZ I07.7. With a master’s degree in jazz composition- arranging from the internationally acclaimed Fine Arts School at Howard University in Washington, D.C., and a resume that would make any jazz fan dizzy, saxophonist Poison moved his family to Merced a year ago to serve as a jazz director at Merced College. Poison has shared audiences with James Brown, Little Richard, Bettye Swan, Z.Z. Hill, Joe Williams, DJ. Rodgers, Gil Scott-Heron, Fred Wesley, Lee Garrett and a host of othets on stages around the world. He has also performed on national television (CBS) with Kenney Burrell, Jimmy Heath, Phil Woods. David Sanborn and Winton Marsalis. During the educator’s musical career, he has‘ been sought as a clinician and also as an adjudicator for concert band and jazz band competitions. He has taught both public and private school in Fresno and in Bogota, Colombia, and Rio de Janeiro, Brazil; given clinics, performances and lectures on jazz in Beijing, China; and: is presently teaching at Merced College. Many of Polson‘s smooth jazz compositions on his new compact disc. 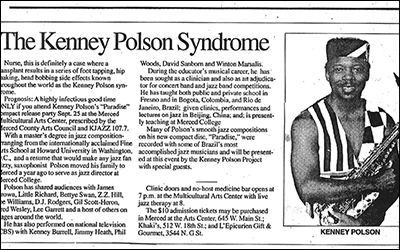 “Paradise,” was recorded with some of Brazil’s most accomplished jazz musicians and will be presented at this event by the Kenney Poison Project with special guests.